Accomplishing what can be significant operational improvement requires connected products, data integration and analytics. Because the IoT involves both connections inside a building to the wider world and to remote locations for broader control and analysis, ensuring proper cybersecurity across the entire system is critically important. Effective solutions also need to adhere to BACnet, KNX and/or other industry standards and open protocols to enable integration. 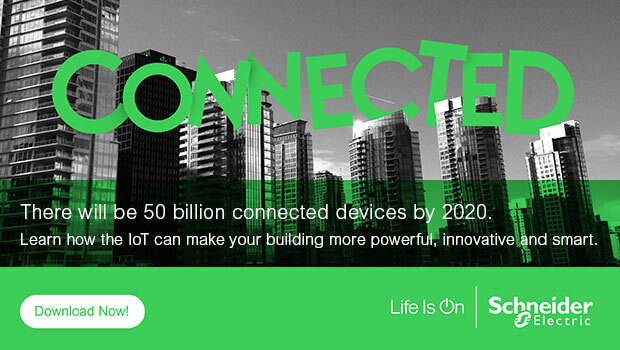 This is why a collaborative smart building IoT platform like EcoStruxure™ Building is key. When connected to a BMS, IoT-ready hardware will deliver efficiency and enable system optimization and overall collaboration. As part of an overall smart building solution, BMS and IoT-ready products and services will greatly impact and increase efficiency across building operations. Part of an effective solution will also involve predictive maintenance, which detects impending issues before they become problems. This means fewer calls in the middle of the night because something has broken or failed unexpectedly. This also makes it possible to schedule fixes and maintenance when there is less disruption and most likely less expense, not to mention avoiding unplanned downtime. Other advances that will be part of the new smart building toolkit include on-the-fly adjustments of lighting, HVAC and other systems with anytime, anywhere access. A room controller, for instance, can work with a BMS to ensure that empty rooms go into an energy saving deep temperature setback yet still are brought to a comfortable temperature in time for the next scheduled use of the space. These developments have another important aspect to consider. As noted in a Navigant Research report, “Data Integration for Intelligent Buildings,” the cost of sensors and computing is dropping. At the same time, the software side of management is growing increasingly important and any potential vendor’s capabilities in this area should be evaluated carefully. For more information on these topics, download our “Smart Buildings and the Internet of Things: Unlocking Value” eGuide today. Combining IoT with the vast amount of data available within building automation systems has enormous potential, and will absolutely transform the role of facility management for new builds as well as retrofits.